Much has been made of the 15% foreign buyers tax, with much debate as per it’s overall impact. How much of the recent slow down can be attributed directly to Christy Clark’s tax? CMHC CEO says foreign buyers aren’t to blame after cold calling property managers. Meanwhile a Seattle Realtor says she’s done 10 million more in sales thanks to the tax. In this post i’ll analyze the detached market before and after the tax. We’ll take a look at the composition of homes sold and the average days on market. Prior to the tax, foreign buyers accounted for 13.2% of all real estate transactions, and as much as 25% in areas like Richmond. Since the tax the number has been cut in half to a paltry 3%. Coincidence or not, the average sale prices across Metro Vancouver has fallen 8%. The composition of homes selling has changed since the introduction of the tax. It appears there are fewer high end luxury homes selling and more homes selling under 1 million. As you can see here, the four months leading up to the foreign buyers tax had more homes selling for above 2 million. Since the tax, the composition has changed a bit. However, this can also be attributed to prices falling bringing them into the next lower bracket. The biggest movement has been a 6% increase of homes selling under 1 million. Again, no doubt this is a result of prices falling as well. Perhaps one of the more telling signs is how much longer detached homes are taking to sell. From April- July detached homes under 1 million were taking an average of 29.75 days to sell. From August- November they were taking an average of 39.25 days to sell. A similar patter can be seen for luxury homes sold above 4 million. Going from 42.25 days to 52.25 days. The homes most affected appear to be the ones between 2-4 million. There are more homes selling under 1 million. It appears the ultra luxury homes above 4 million have not been affected nearly as much but rather the homes between 2 and 4 million appear to have slowed down the most. 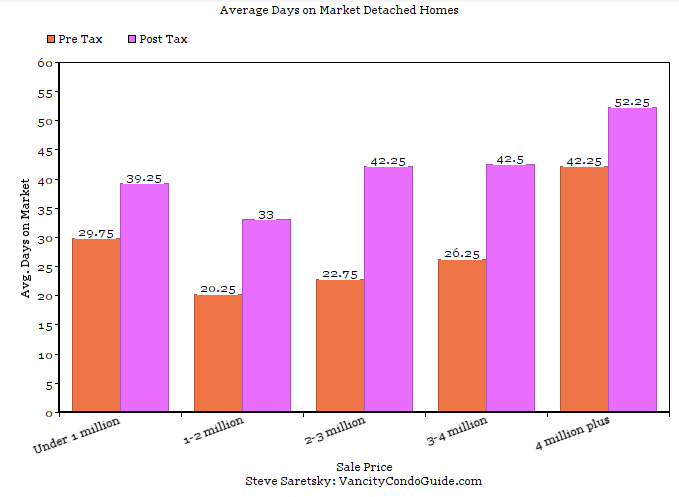 It is taking on average an extra two weeks to sell a detached home post tax. Although an 8% price drop over 4 months may not seem like much, that quietly adds up to 24% over a year.